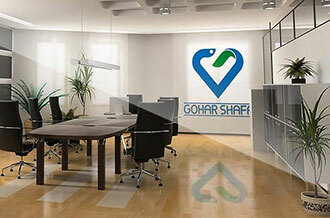 The Gohar Shafa Anti-encrustation ureteral stent continues the legacy of High quality products of this company. It has been engineered to achieve optimal patient comfort by having an ultra-smooth surface and the ability to soften at body temperature. Up to 10 Month reside in body. An indwelling times of up to 10 Month as well as an innovative solution. Tapered stent tip for navigation around obstruction. 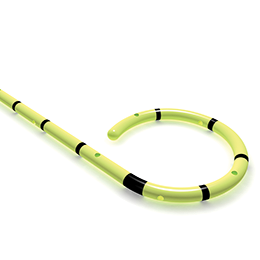 Gradual taper at tip of stent promotes easier negotiation around ureteral obstructions. Smooth surface may reduce the mechanical trauma at the tissue/stent interface and thus ureteral reactions such as ureteral ulcerations, epithelia hyperplasia, inflammation and edema. 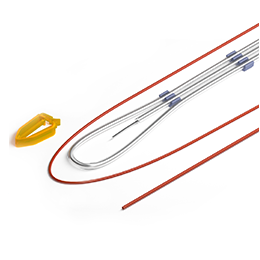 High retention coils at each end of stent help prevent migration while indwelling. Testing demonstrates the superior resistance to urine calcium salt accumulation. The stent comes individually packaged sterile by E.O in a single use, configuration. Available with or without Guidewire. Load stent over the guide wire and advance to port element of scope. Stent should be advanced to point where a portion of the shaft resides outside the scope port element. Advance stent pusher over guide wire until pusher abuts the stent shaft. Advance pusher until stent head positioned in renal pelvis. Retract guide wire and confirm pigtail curl in renal pelvis. Carefully remove guide wire and pusher from patient once stent position confirmed. These Instructions for Use are provided for informational purposes only and are not intended to take the place of product labeling. Knowledge of physician specialists with comprehensive knowledge of the indications, techniques and risks of the procedure is preferential to this instruction for use. This product contains NO natural rubber latex. This device is supplied sterile and recommended for one-time use only. Avoid bending or kinking the stent during or prior to placement as to do so could damage the integrity of the stent. If resistance is encountered during advancement or withdrawal of the stent, STOP. Do not continue without first determining the cause of resistance and taking remedial action. Periodic radiographic, isotopic, or cystoscopic examinations are recommended to evaluate stent efficiency and to observe for possible complications. This stent is not intended to be a permanent implant device. The recommendations given herein are meant to serve only as a basic guide to the utilization of this device. Use of this device should be restricted to physician specialists with comprehensive knowledge of the indications, techniques and risks of the procedure. A pregnant patient must be more closely monitored for possible stent encrustation due to calcium supplements. Sterile if the package is unopened or undamaged. Do not use if package is broken. For single use only. DO NOT REUSE, REPROCESS OR RESTERILIZE. Reuse, reprocessing or resterilization may compromise the structural integrity of the device and/or lead to device failure which in turn may result in patient injury, illness or death. Reuse, reprocessing or resterilization may also create a risk of contamination of the device and/or cause patient infection or cross-infection, including, but not limited to, the transmission of infectious disease(s) from one patient to another. Contamination of the device may lead to injury, illness or death of the patient.